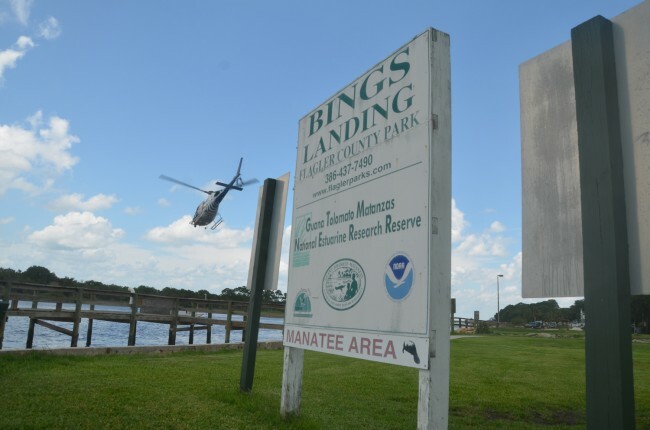 Dana Morris pilots Fire Flight—Flagler County’s emergency helicopter—to what looked like an ideal landing pad next to the boat launch at Bing’s Landing. 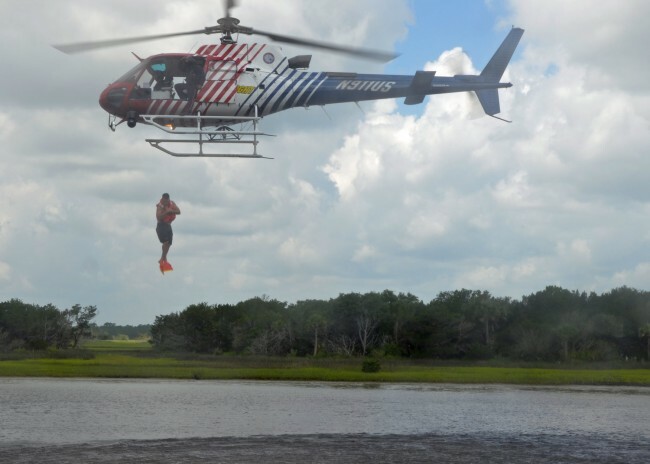 A rescue swimmer runs out to the chopper, get strapped in on its deck. The chopper takes off, making a large arc about a half mile north over the Intracoastal, with boat traffic stopped at either end of the training area as Fire Flight hovers back down above the water, 30, 40 or 50 feet high. The swimmer jumps out, rescue bouee and feet first, to be himself picked up by another rescuer speeding in on a jet-ski below. As Fire Flight returns to the landing pad, Intracoastal traffic is reopened for a couple of minutes, then closed again for another helicopter run. 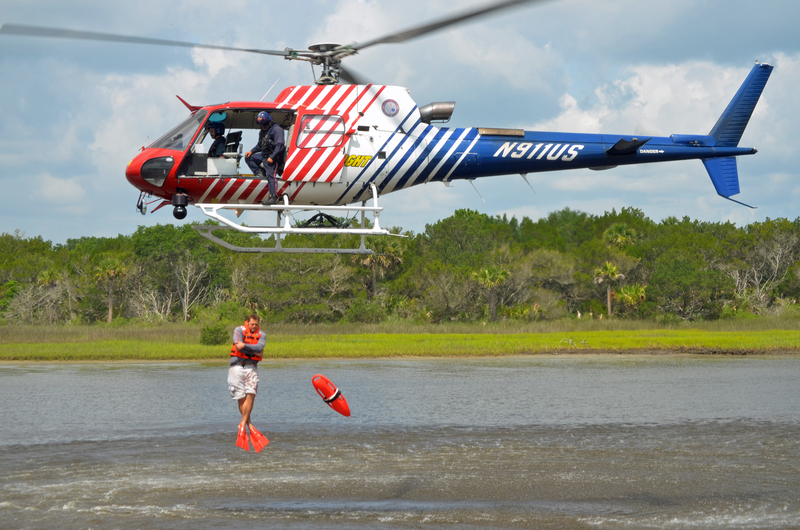 So it went all morning and into early afternoon Wednesday as Fire Flight, the Flagler County Sheriff’s Office, the Florida Fish and Wildlife Conservation Commission (which provided traffic control on the Intracoastal) and Flagler County Fire Rescue teamed up to train 10 Flagler firefighters and five sheriff’s deputies in a technique that will vastly enhance authorities’ speedy rescue capabilities in case of waterborne accidents offshore. 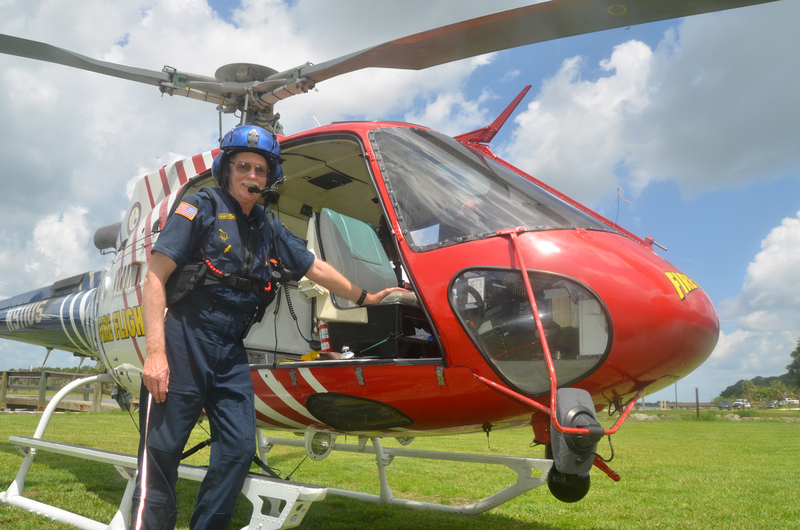 The exercise was also a rare, public look at the county’s first responders in close-up action–time, perhaps not coincidentally, with the county’s budget wrangles, which have hinted at crimping rescue operations. 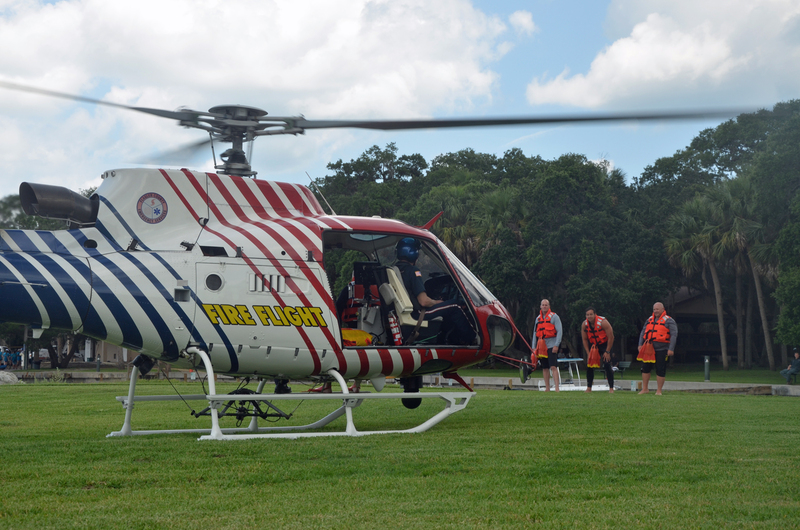 “Basically this is going to be another component of our marine rescue team,” Flagler County Fire Chief Don Petito said. Twenty-eight of the department’s 75 firefighter-paramedics and lieutenants are certified members in marine rescue. Petito wants to double that number. He also wants to have numerous rescuers trained in jumping from the helicopter. Aaron Price, who’s been with Fire Rescue eight years, is the team leader for the Marine Rescue Division. 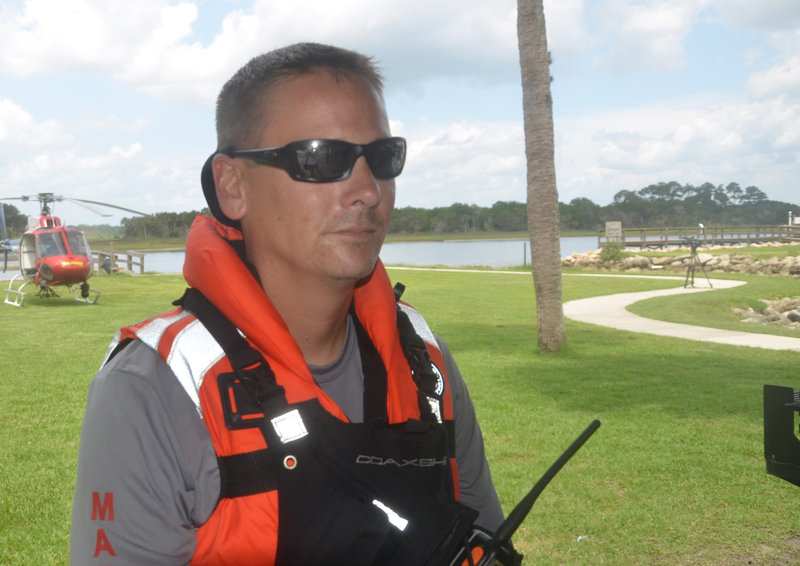 He was on the jet ski today, retrieving swimmer after swimmer, while communicating through his marine radio with shore and the helicopter. Dennis Moore, 25, of Palm Coast, based at Station 41 in the Hammock, was among the swimmers training today. “It’s an adrenaline rush. It’s not a normal thing to sit on the edge of an aircraft and be out there,” Moore said shortly after a jump. “You have a little lap belt on, you’re belted in safe, pretty much, but the wind rushing through you, I guess it’s kind of like a motorcycle, a couple of hundred feet in the air.” He had done three jumps so far, and went through the check-list of factors to keep in mind during each jump. It’s not a matter of just sitting on the deck and waiting for two taps on the shoulder. He spoke while Morris, the pilot, and swimmers took a break for debriefing, and to exchange pointers and what to try next. “It doesn’t hurt at all, as long as you hit the water correctly, your feet break the fall, and you fall in like you’re diving, with your feet first,” More said. A couple of strong kicks, and the swimmer is back at the surface. Moore has never done a water rescue jumping out of a helicopter, but he’s conducted rescues from water level, with jet-skis. 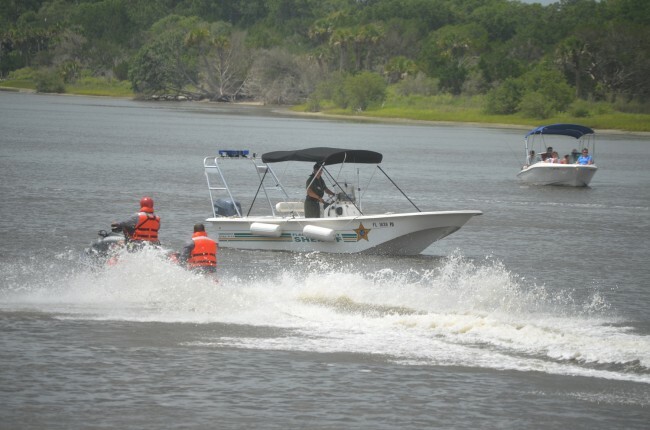 Swimmers in trouble are typically panicked from having been pushed out by rip currents and being exhausted. The moment they have a rescuer within reach, they cling to the point of risking to drown their own rescuer, who are well trained to anticipate the movements and the victim’s panic. The training appeared to go flawlessly throughout the day. 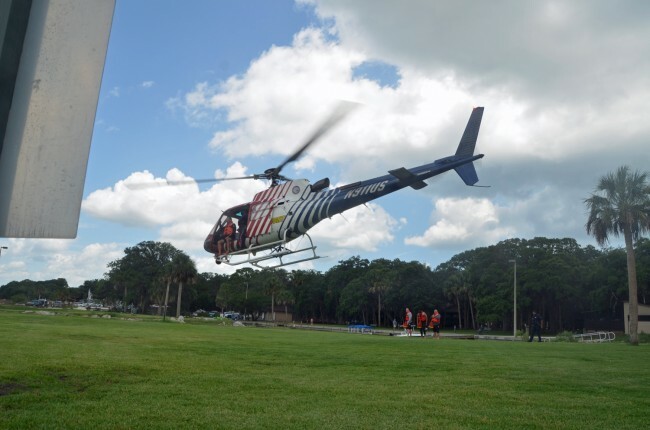 (The helicopter was back at the airport at 2:30 p.m.) Today’s training was conducted in the relatively safe and controlled environment of the Intracoastal, under light winds and weather conditions leisurely enough that kayakers and boaters jammed the waterway, when they were allowed to pass. But it’s the ocean swimmers must be ready for. That’ll be next. 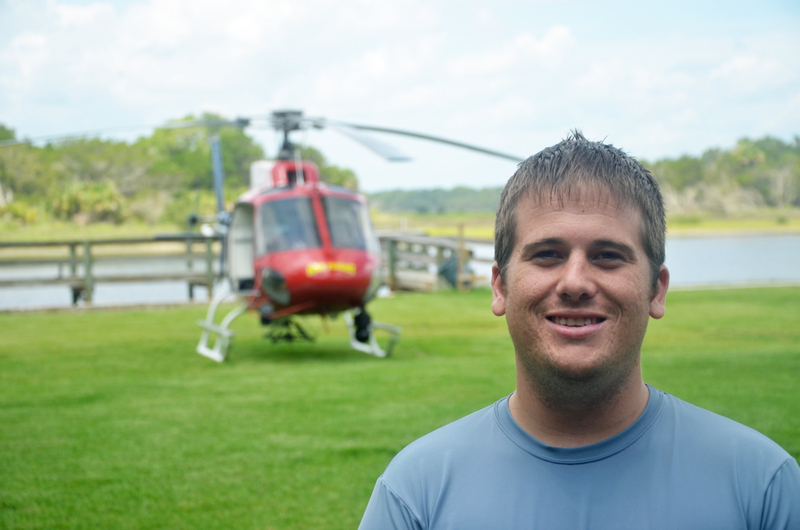 Fire Flight doesn’t spend unnecessary time too close to the ocean surface because salt wears on the helicopter’s machinery. Once in place, the combined capabilities of helicopter and waterborne rescues will close what had been a gap in rapid emergency responses on the water. That doesn’t mean improving rescue capabilities to include Fire Flight isn’t necessary. “The jet ski is restricted to how far it can go. Obviously it’s not safe to put the jet ski out of, let’s say, line of sight, out into the ocean. That’s where the helicopter would come in. If you have let’s say a boat that’s three miles off shore and it’s taking on water, it’s going down, and they’ve got passengers on board, the helicopter could fly out the rescue swimmer. If you notice when the rescue swimmer jumps from the helicopter, he has a red bouee in his hand, that red bouee is capable of floating six people. 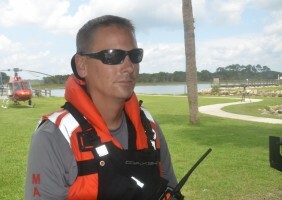 So what he would do then, he has on a life vest, so he’s already floatable, he would give off that bouee and allow up to six people to grab on to that bouee, and that’ll keep them afloat until we can get better resources to them to get them to shore.” Most likely, a Flagler County Sheriff’s rescue boat, Fish and Wildlife or the Coast Guard. A department-wide email solicited interest from anyone at Fire Rescue interested in joining the marine division, which gets immense interest among firefighter-paramedics. As long as they pass the swimming test, they can qualify for the class. It’s not summer camp. The test consists of completing a 1,000-meter swim in less than 30 minutes. That’s 20 laps in a 50-meter pool. Numerous visitors passed through Bings Landing—a county park—during the exercise, stopping at Mike Goodman’s Captain’s BBQ, which opened there last year. 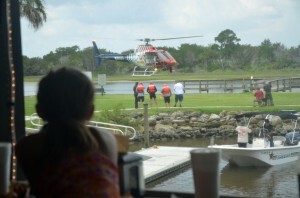 Many watched the helicopter take off and land time after time from ideal mezzanine seats as they had lunch on the deck of the restaurant. But it’s not as if business picked up particularly: the county hadn’t announced the training, and State Road A1A has been a clutter of construction and repaving, diminishing traffic to Bing’s Landing, if anything. Goodman wasn’t complaining. “Everyone in the park is real impressed with our state of readiness,” Goodman said, referring to the rescue capabilities. As for Captain’s BBQ? “Slowly but surely, more people are coming into the park,” he said. “Business can always be better, but for the first year I’m OK with it.” He called it “a work of love.” Firefighters and cops, who aren’t paid much, might say the same thing about their job, especially today.